This Muslim Girl Bakes: Chocolate Chip Brownie Swirl Cookies. 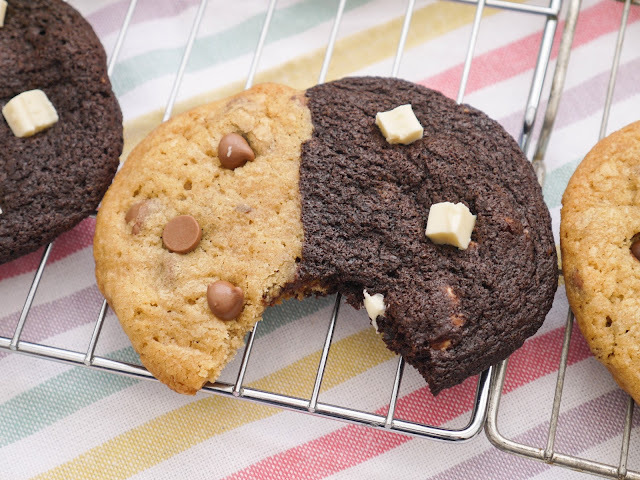 Chocolate Chip Brownie Swirl Cookies. It's time for my annual cookie recipe of the year! It was last year, when sharing these cookies that I realized that I had posted a different cookie recipe in every year that I had blogged. What can I say? 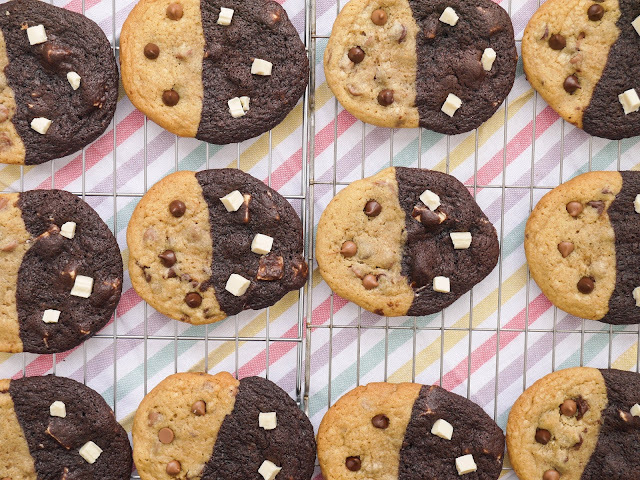 We love cookies. 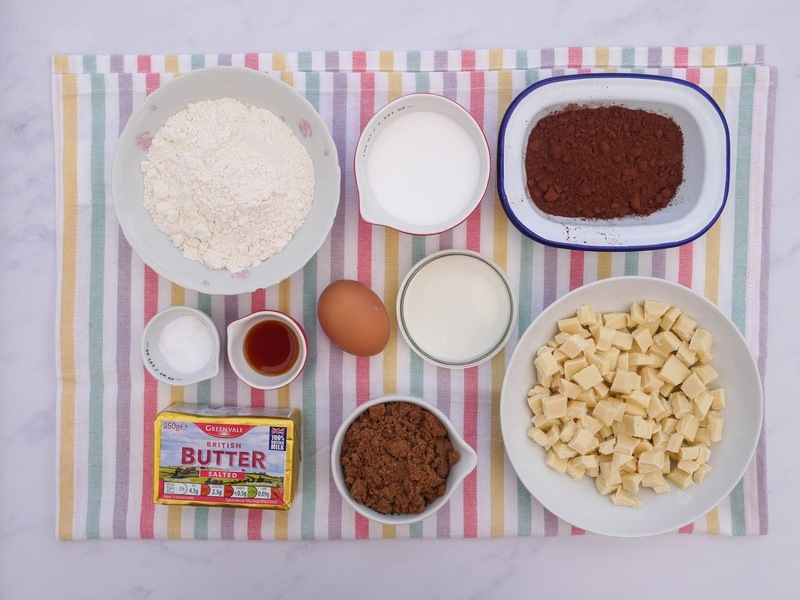 Honestly, they're so easy to make and require basic ingredients. 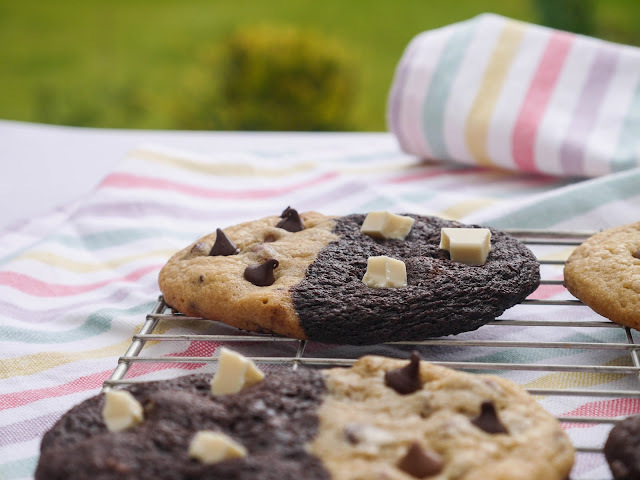 Out of all baked goods, cookies are what I make most often. 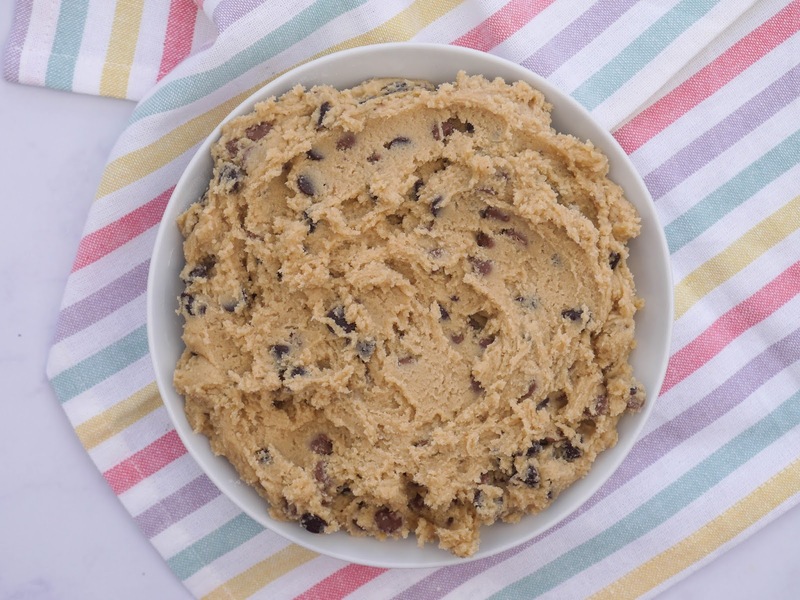 For me, there is something so familiar and almost therapeutic when I mix together a cookie dough. 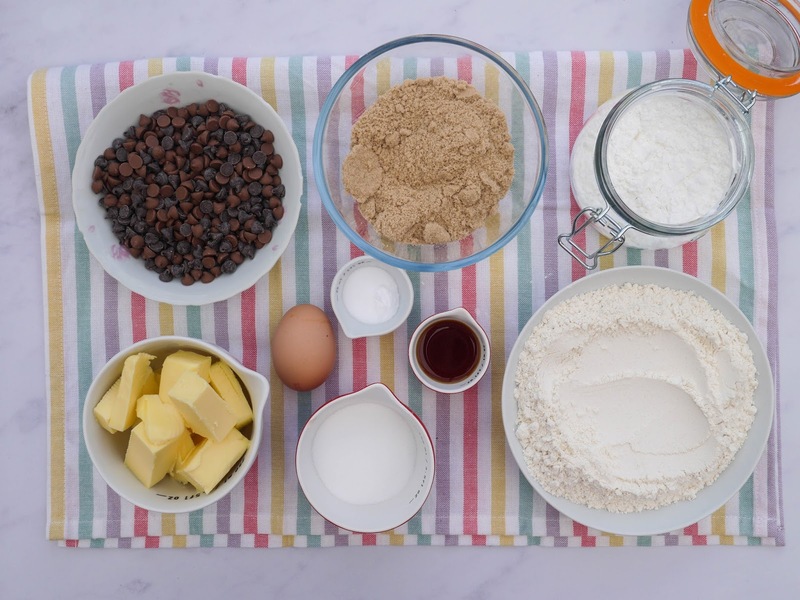 The butter and sugar, the vanilla and egg, the flour, raising agent and salt, the chocolate chips. So much so, that for these swirled cookies, we're going to make two cookie doughs. A chocolate brownie one with white chocolate chunks and a classic chocolate chip one. 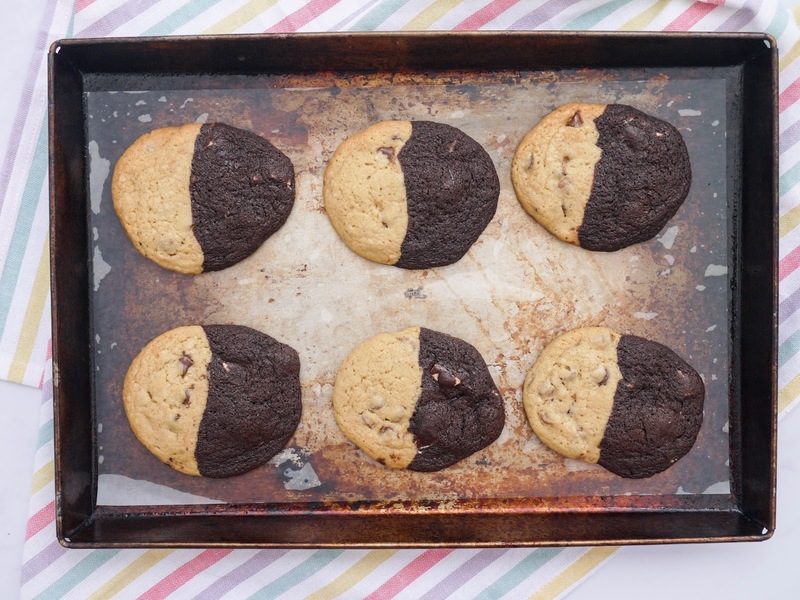 Both of them would work well simply rolled into balls and baked as they are but if you want the wow factor, stick two of those balls together for a striking swirl cookie. 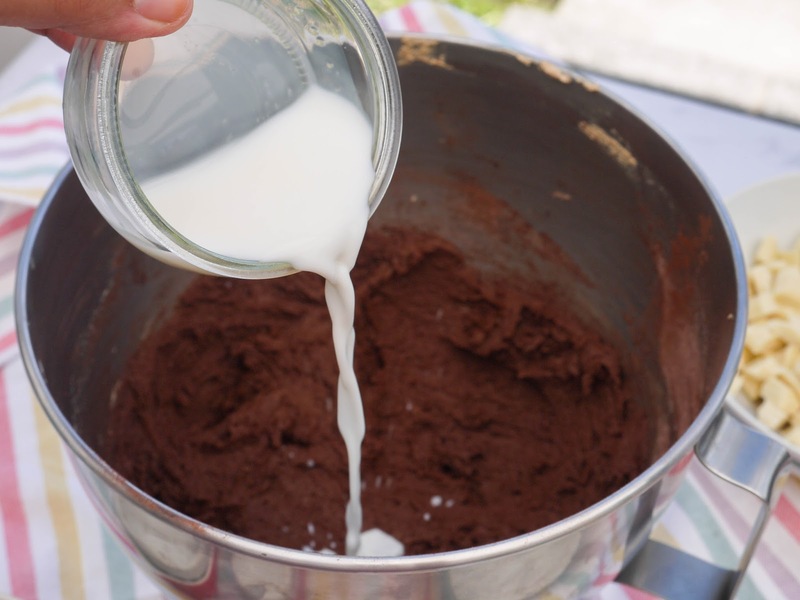 My nieces and nephews love making these cookies with me. 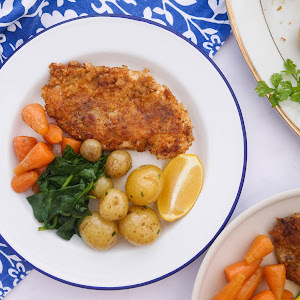 The girls have been bugging me for a while to post the recipe on the blog so that they can make them on their own at home. They're becoming quite the bakers. 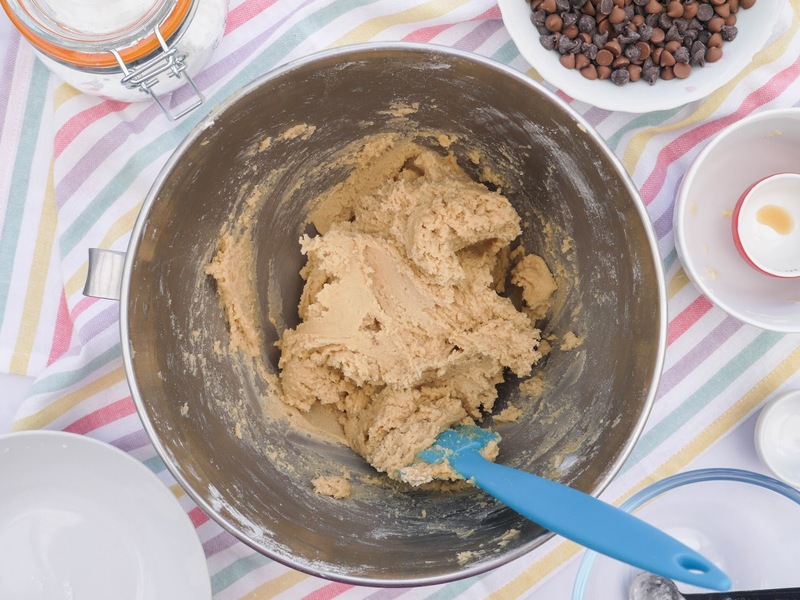 Rolling the cookie dough balls can be a little messy so I like to wear disposable gloves. 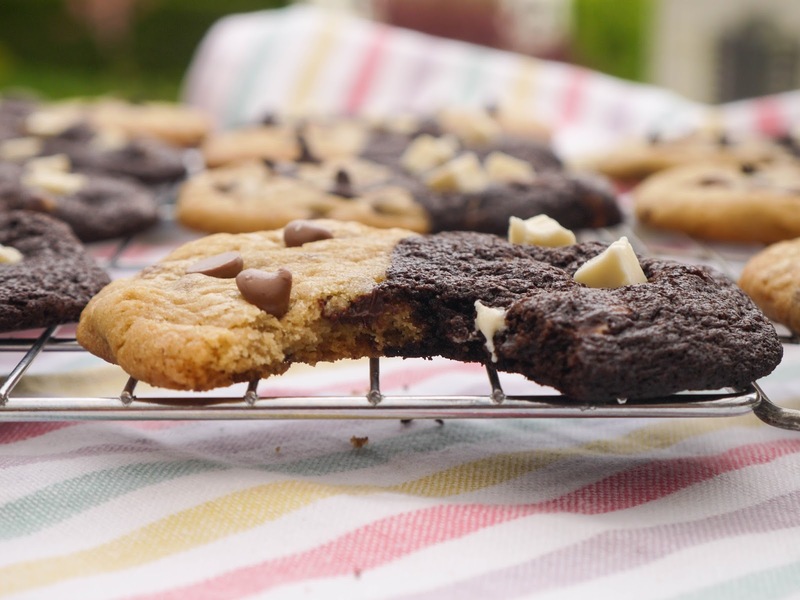 Once baked, the cookies are gooey when warm. When they firm up, they're great dunked in hot coffee and make the best ice cream sandwiches. We start by making the first cookie dough - a white chocolate brownie cookie dough. Starting with two kinds of sugar - soft light brown and caster. 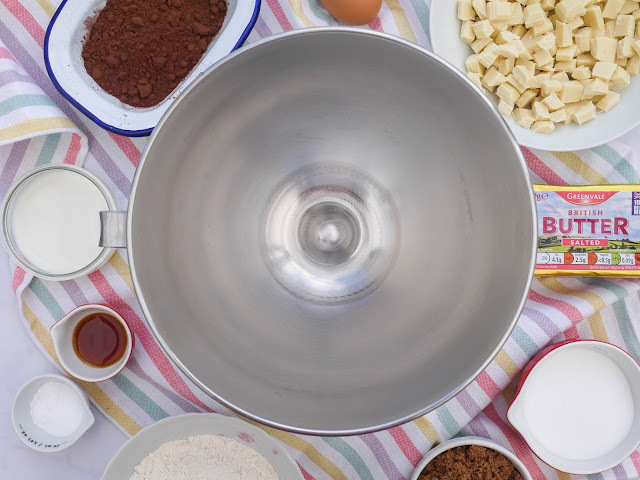 Into a large mixing bowl, place 100g Caster Sugar. 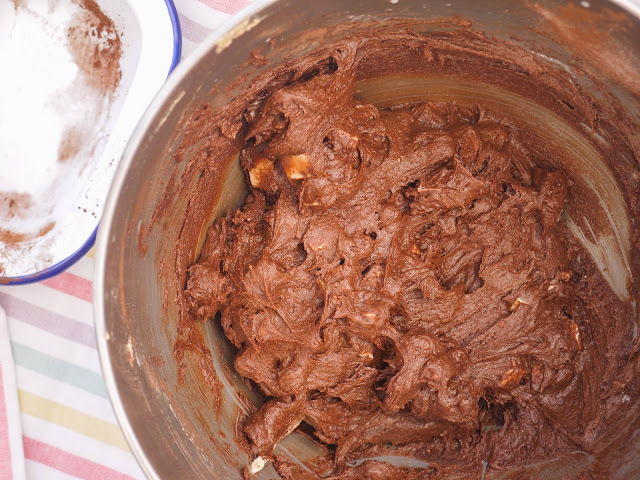 Add in 115g Butter, softened. 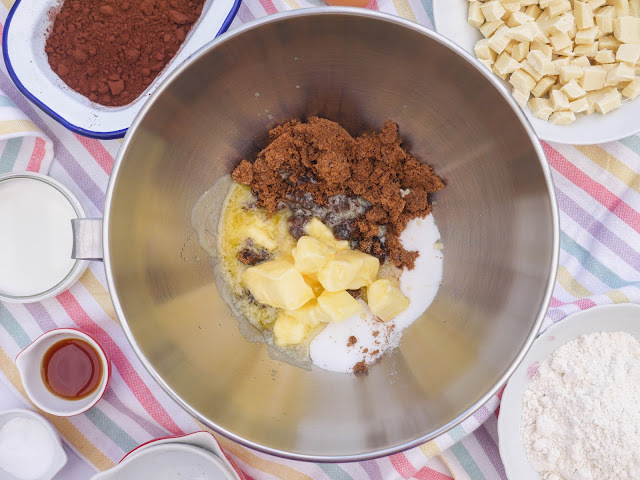 Beat the three together with an electric hand mixer or a stand mixer with a paddle attachment until pale and well combined. Beat for at least 5 minutes. 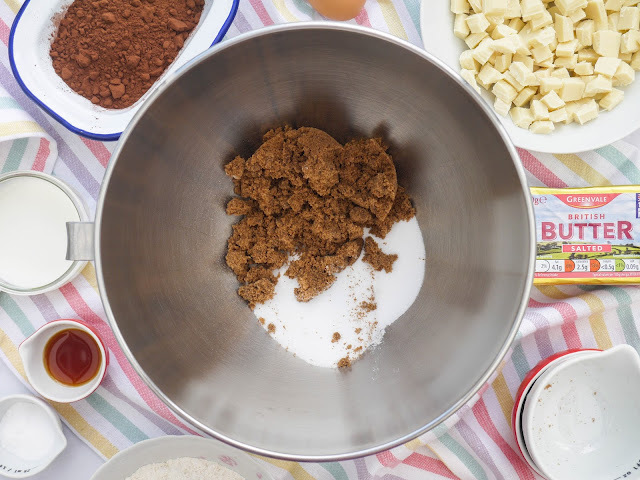 Scrape the bowl down with a spatula. Look at that beautiful texture! 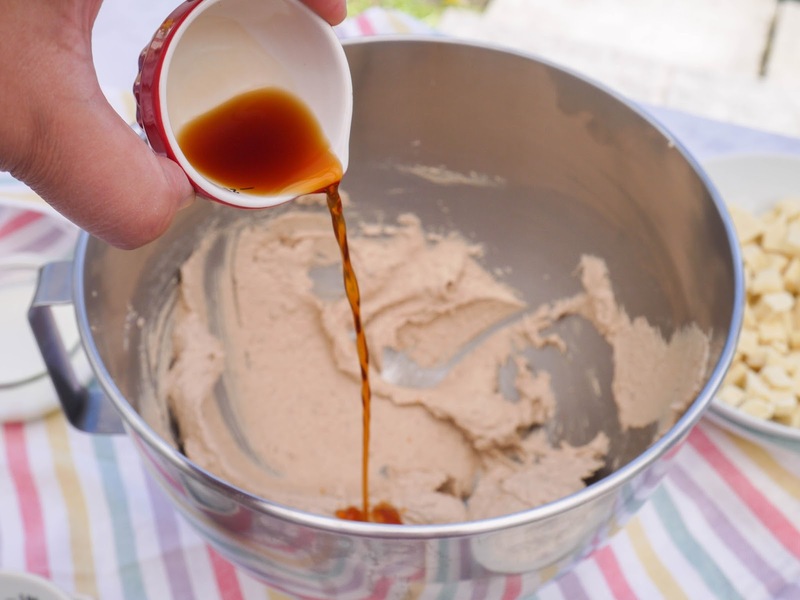 Let's flavour things with 1 teaspoon Vanilla Essence. Before cracking in 1 large Egg. Beat together until really well combined. 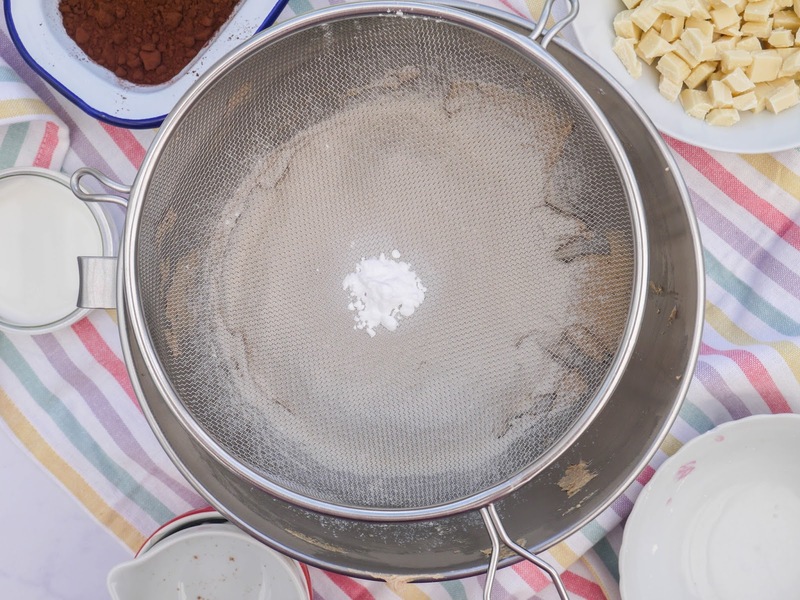 Then, set a sieve over the mixing bowl. 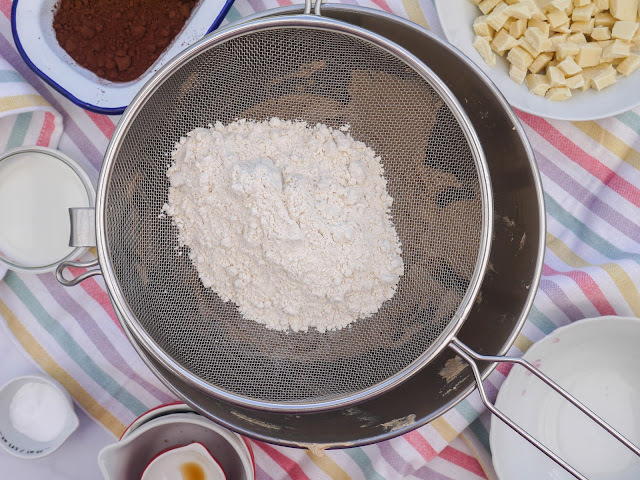 Sieve in 125g Plain Flour. Along with 1/2 teaspoon Salt and 1 teaspoon Bicarbonate of Soda. Then, to give our cookies their colour and chocolatey flavour, cocoa powder. 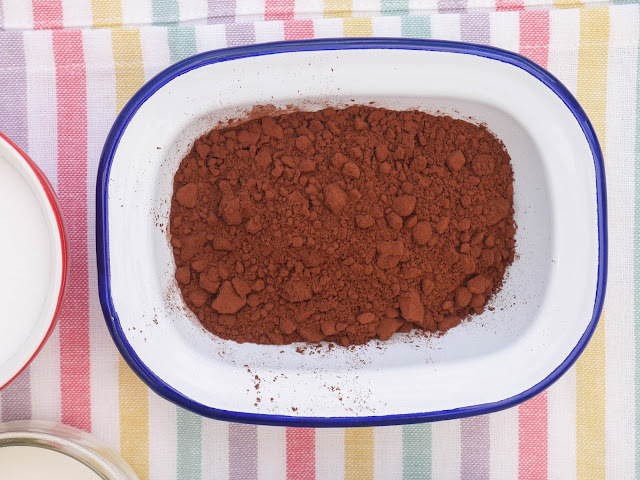 Sieve in 50g Cocoa Powder. 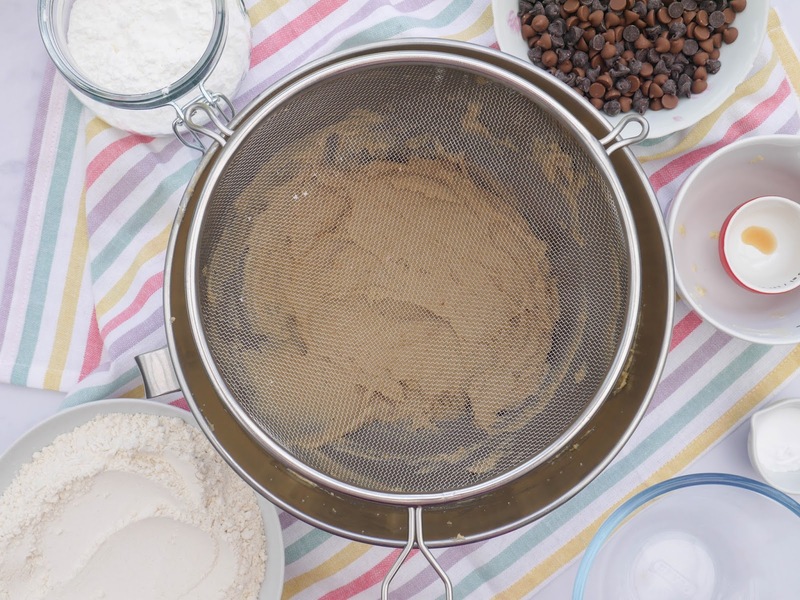 Once all the dry ingredients have been sieved in, let's mix! Beat together until everything is well combined and you can no longer see any flour. To soften the dough, pour in 30ml Milk. Stir in until well combined. Look at that dough! 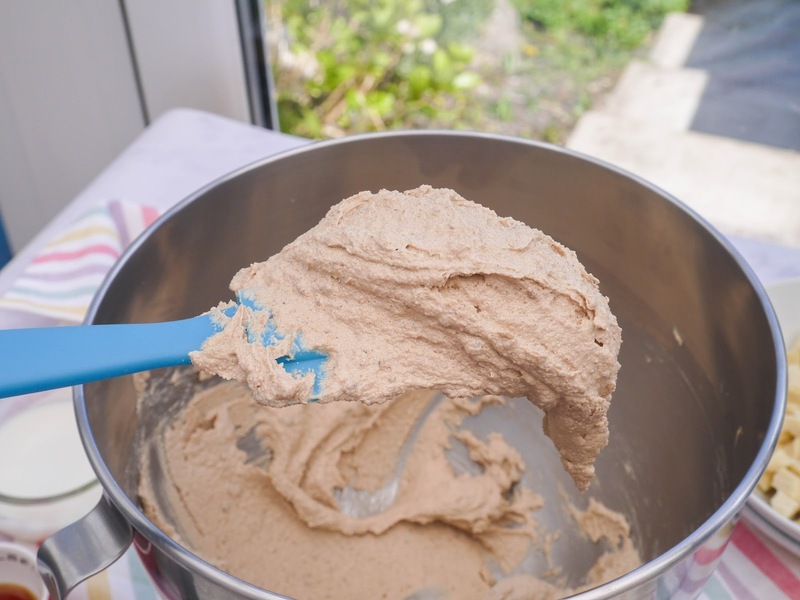 It is more of a batter than a dough but a good chill in the fridge will firm it up. 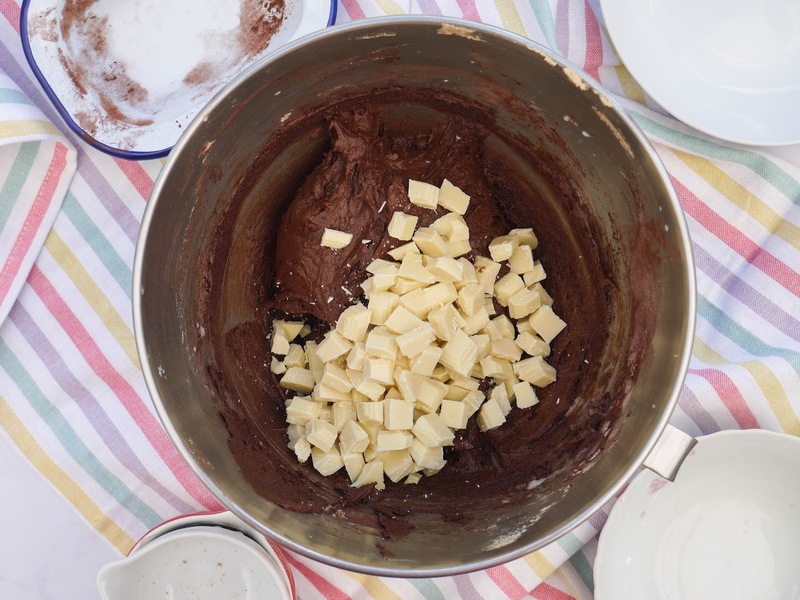 Throw in 200g White Chocolate Chips or Chunks. 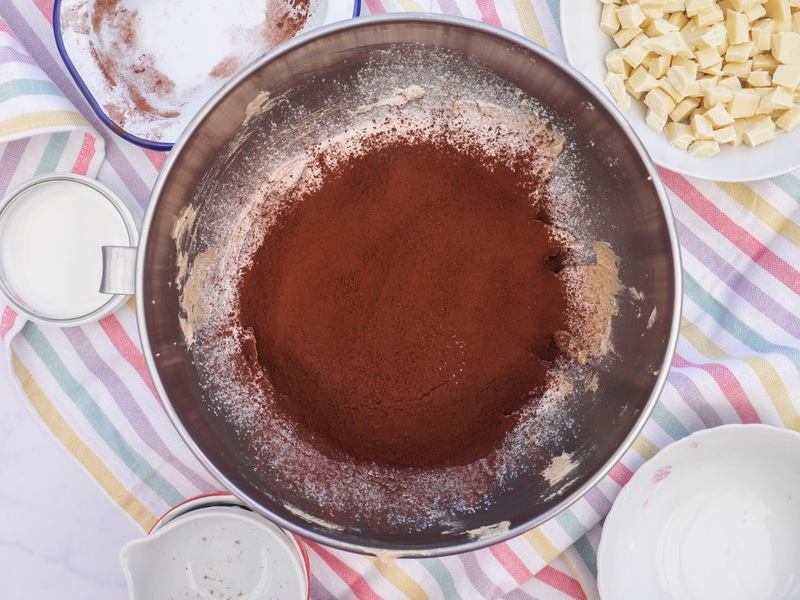 You may save a few of them to decorate the cookies once baked. I didn't have any white chocolate chips so I chopped up a few bars of it. 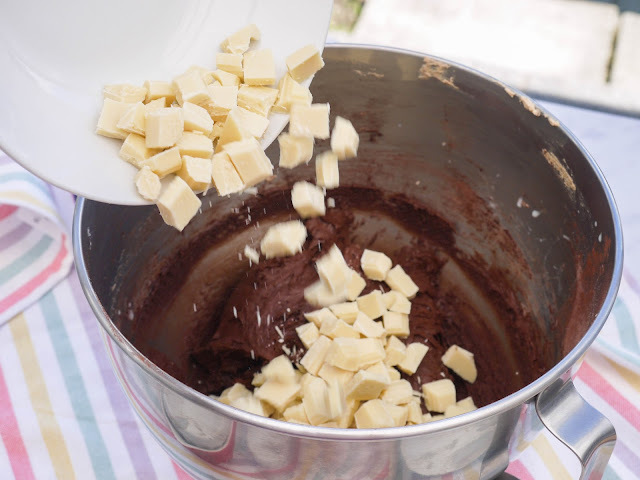 Beat again until the white chocolate is well dispersed within the batter. 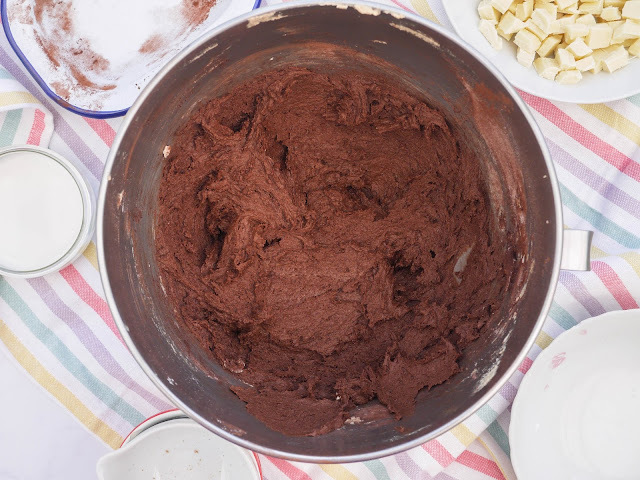 Scrape the batter into a bowl and chill in the fridge. You could chill for a few hours but I much prefer overnight. 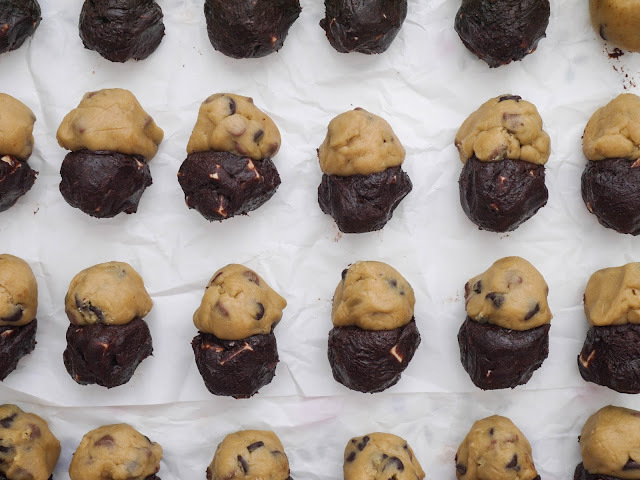 It will make the cookie balls easier to roll. 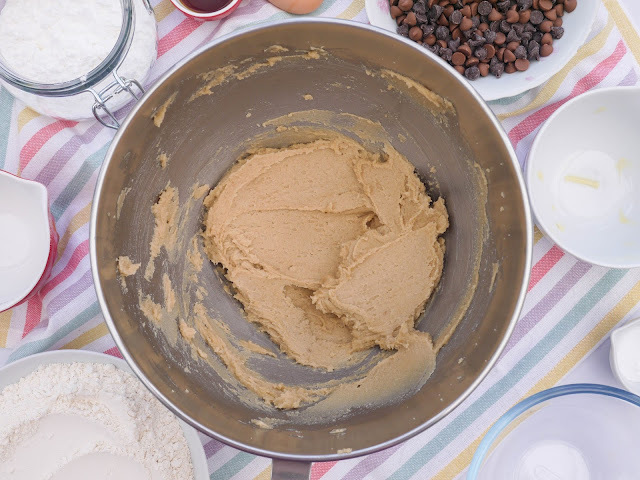 Next, let's make the chocolate chip cookie dough. In a large mixing bowl, place 170g Butter, softened. 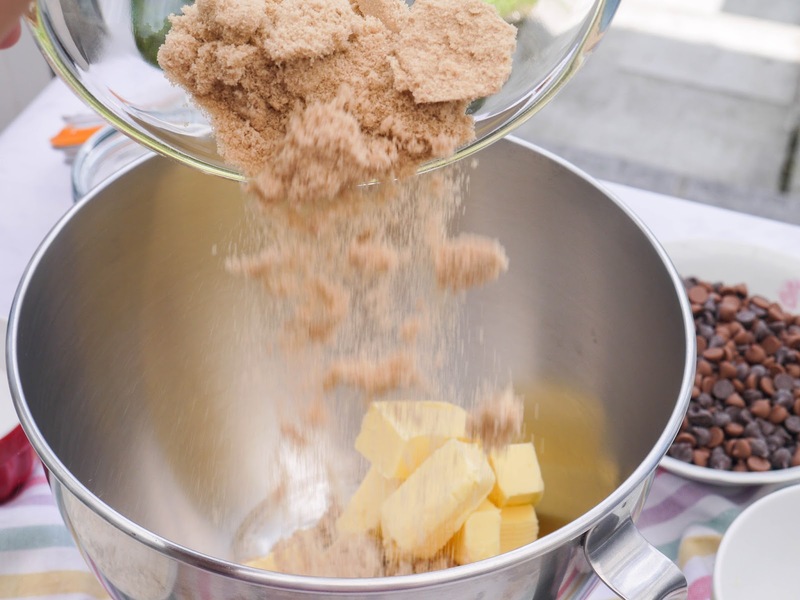 Sprinkle in 150g Soft Light Brown Sugar. Along with 50g Caster Sugar. Beat everything together with an electric hand mixer or stand mixer with the paddle attachment. 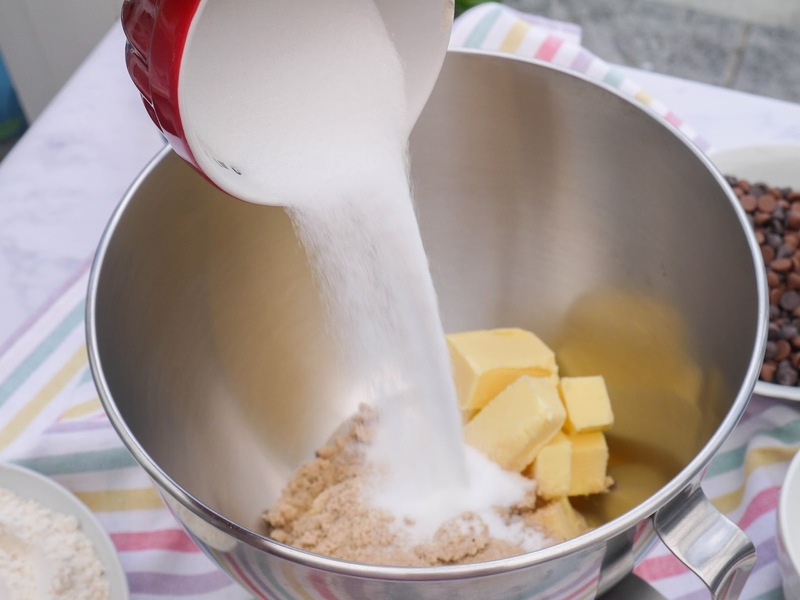 I like to beat the butter and sugars together for 5 minutes until really pale and creamy. 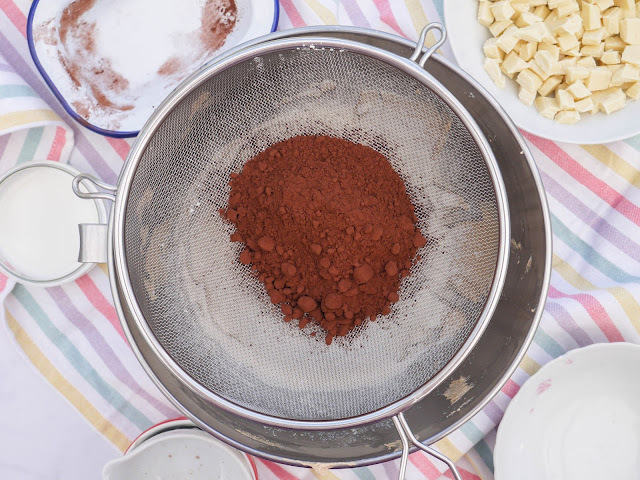 For the dry ingredients, place a large sieve over the mixing bowl. 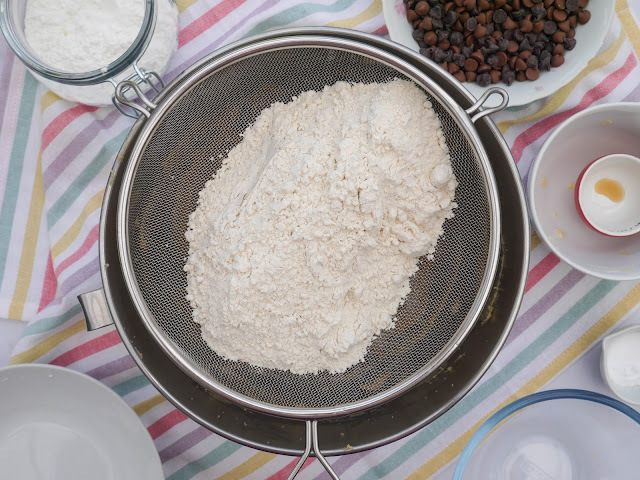 Sieve in 250g Plain Flour. 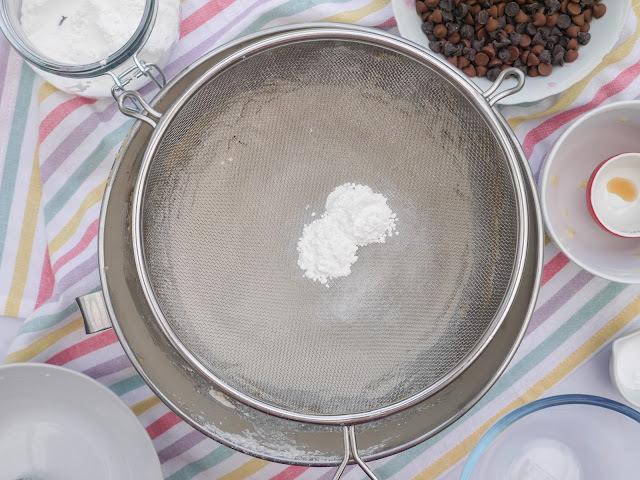 Along with 2 teaspoons Cornflour. 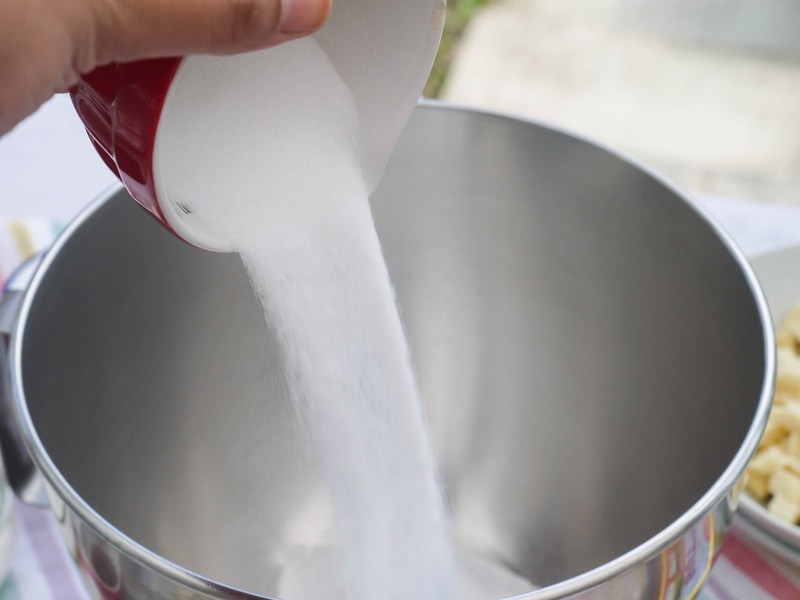 And, 1 teaspoon Bicarbonate of Soda and 1/2 teaspoon Salt. 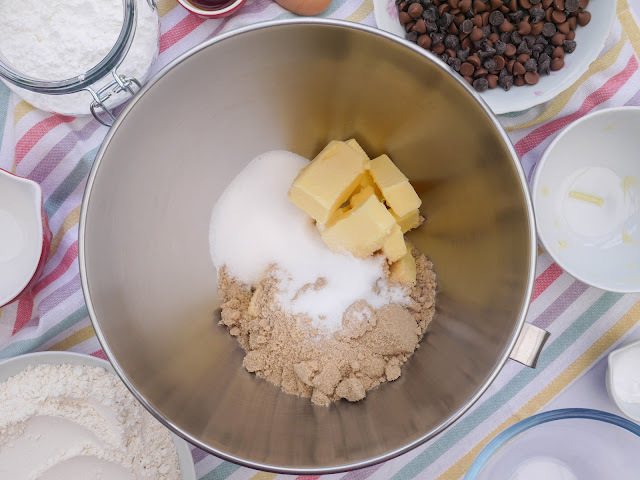 ... mix really well with the electric mixer until you can no longer see any flour. This cookie dough will be a lot stiffer than the previous one so you won't have to chill it in the fridge as long. But first, chocolate! 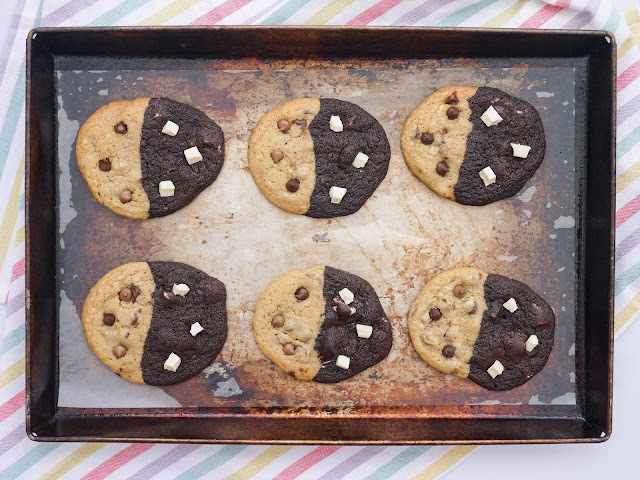 I used a mixture of dark chocolate chips and milk chocolate chips but you can use either. 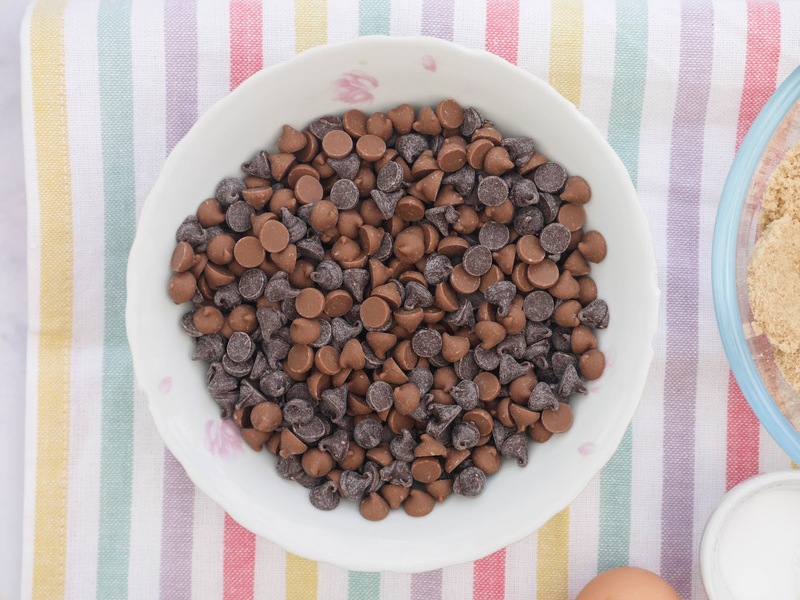 Throw in 100g Milk Chocolate Chips and 100g Dark Chocolate Chips. 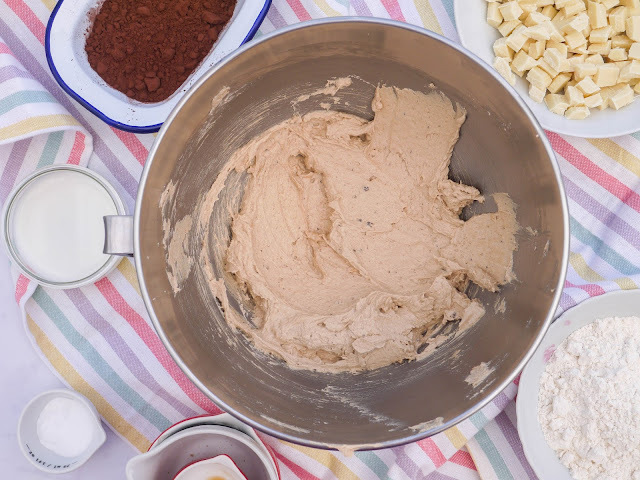 Save some of them to decorate the cookies once baked, if you prefer. 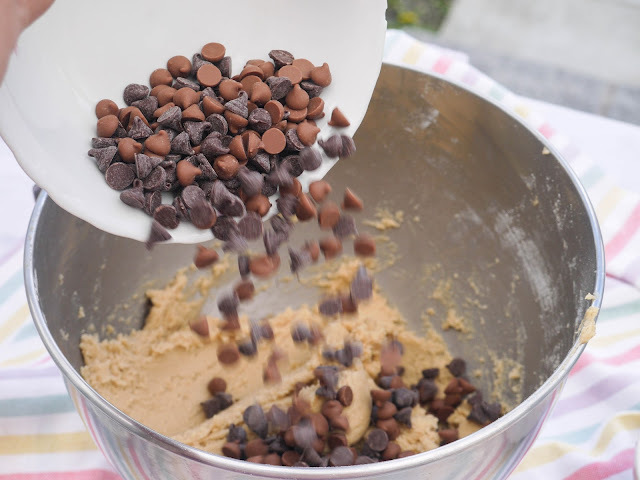 Beat until the chocolate chips are well dispersed in the dough. 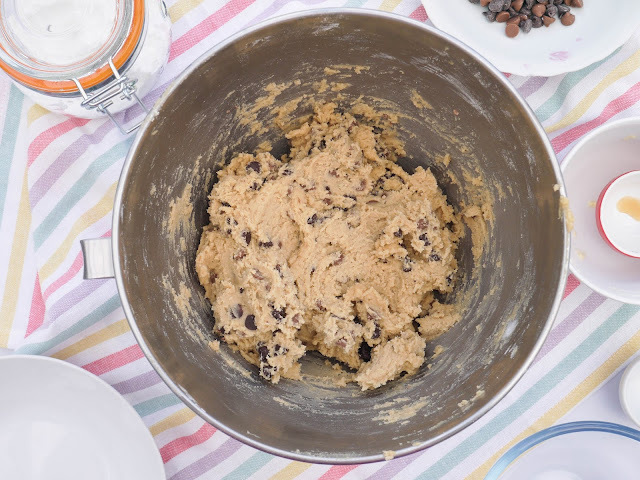 Scrape the cookie dough into a bowl and chill in the fridge for a few hours or overnight. 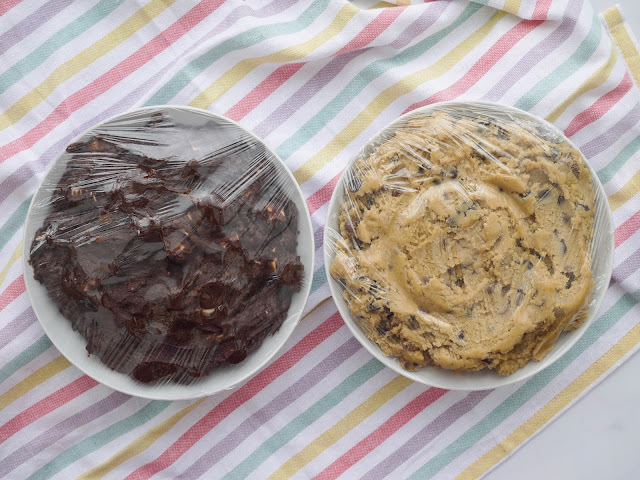 I let both cookie doughs chill overnight in the fridge. 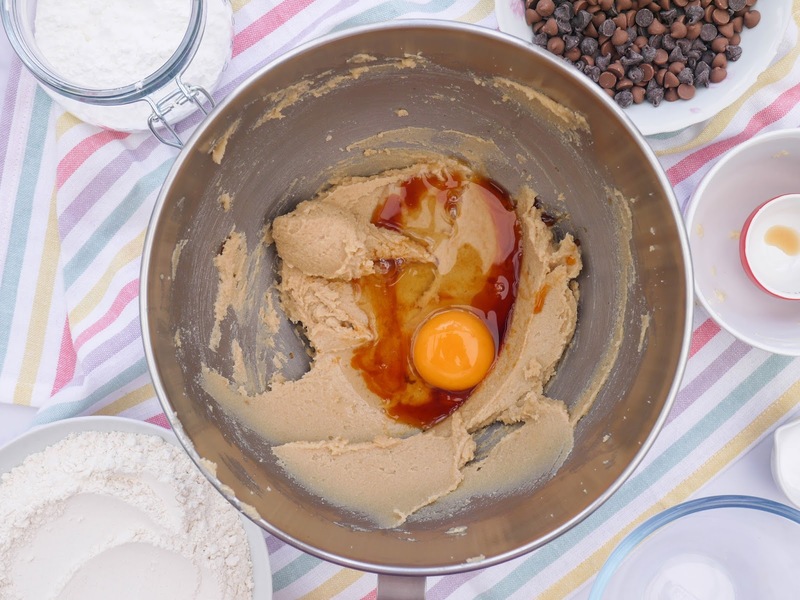 The next day, it was time to make the cookies. 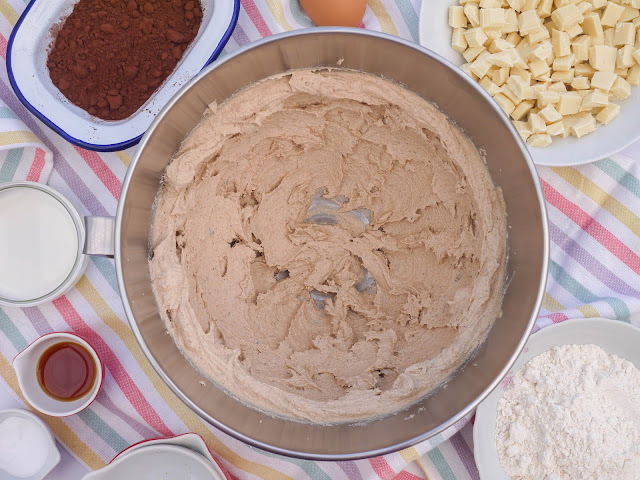 Let the dough sit at room temperature for around 15 minutes to make it easier to shape. So, with these swirl cookies, we want to shape both each cookie dough into equal sized balls. 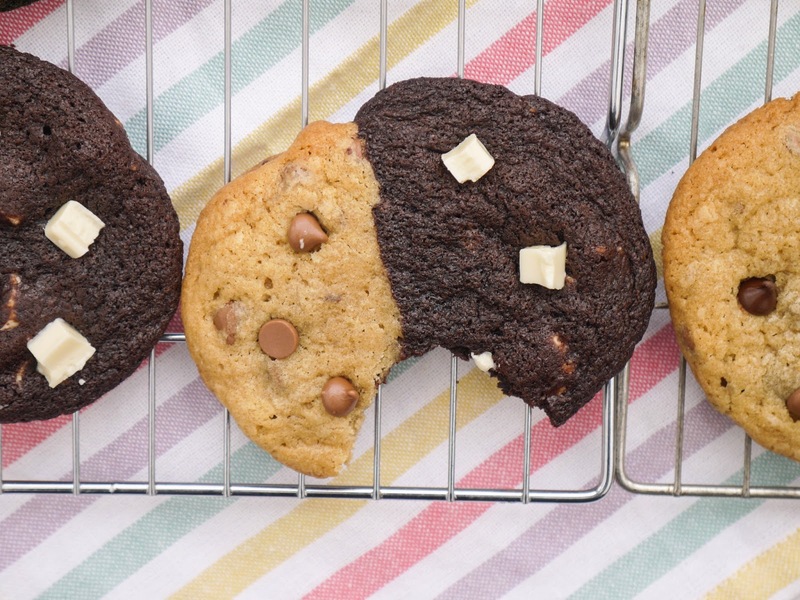 We don't want to make the balls too big as two of them will be stuck together to make one cookie. 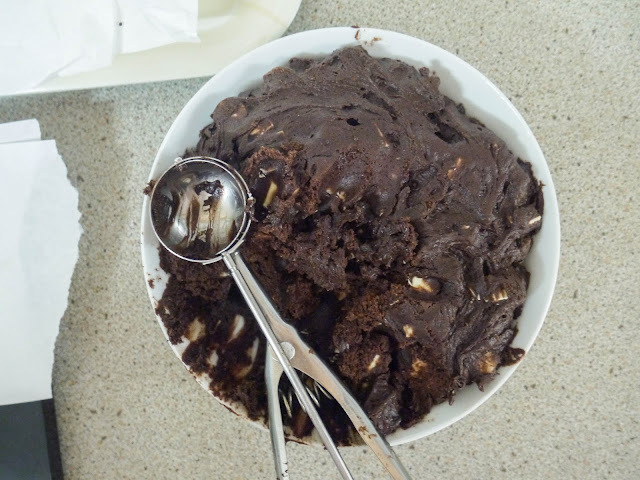 I used a small ice cream scoop to shape the balls - around 1 tablespoon. 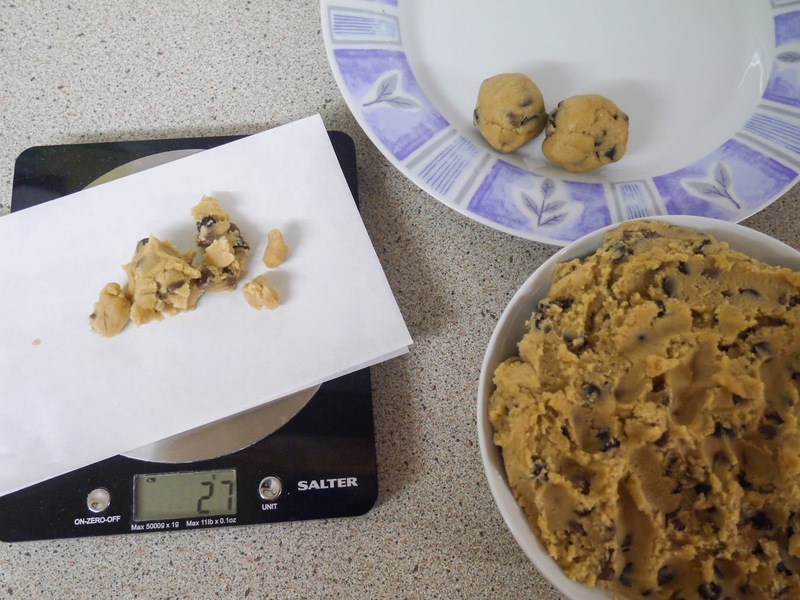 If you want to be really precise, each of my cookie dough balls were 27g. 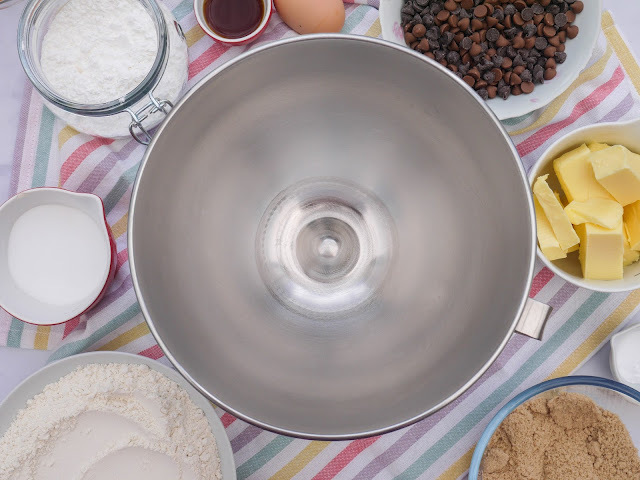 Pop a piece of baking paper over the weighing scale to stop it getting dirty. 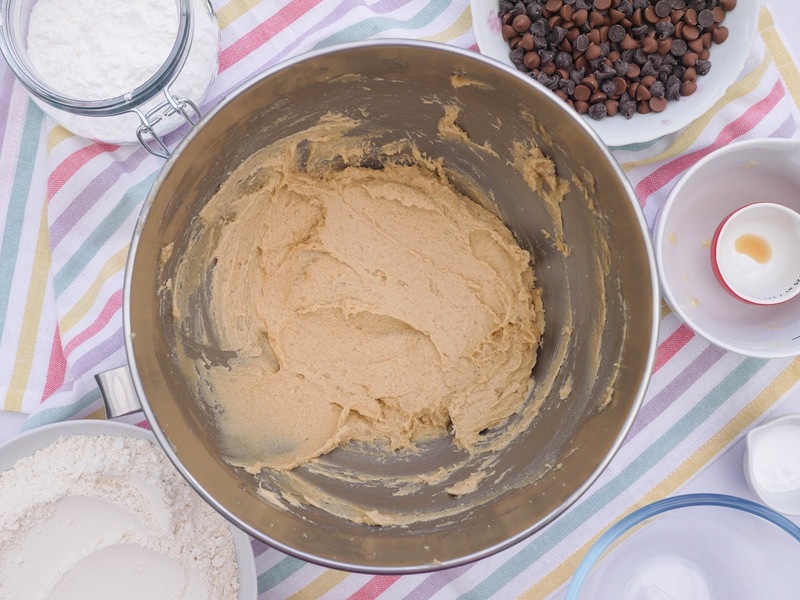 Roll the cookie dough into balls. 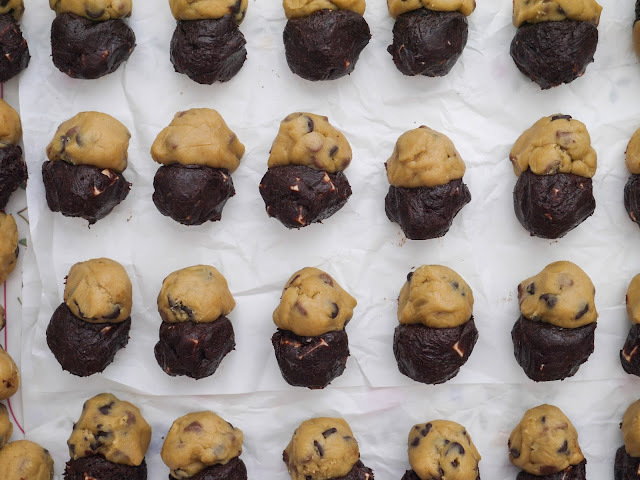 I wore disposable gloves to do this because the brownie cookie dough can be pretty sticky. 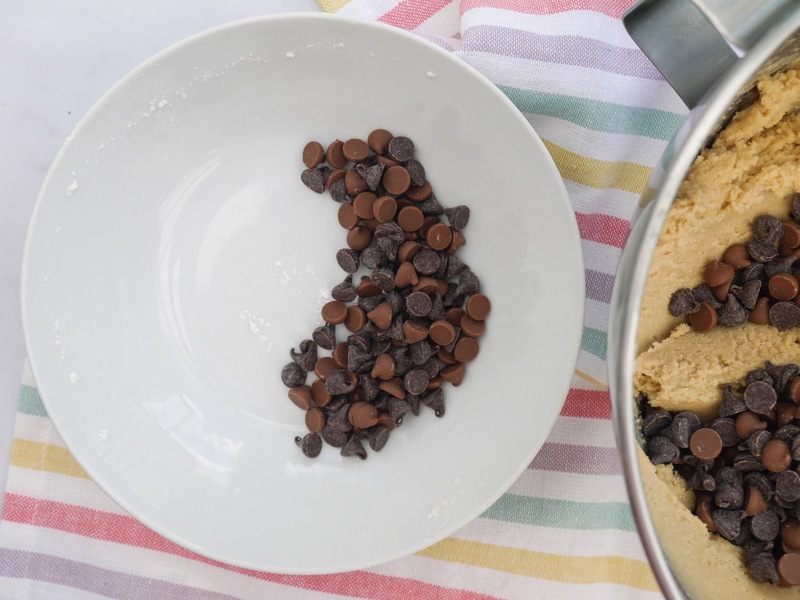 Do the same with the chocolate chip cookie dough. 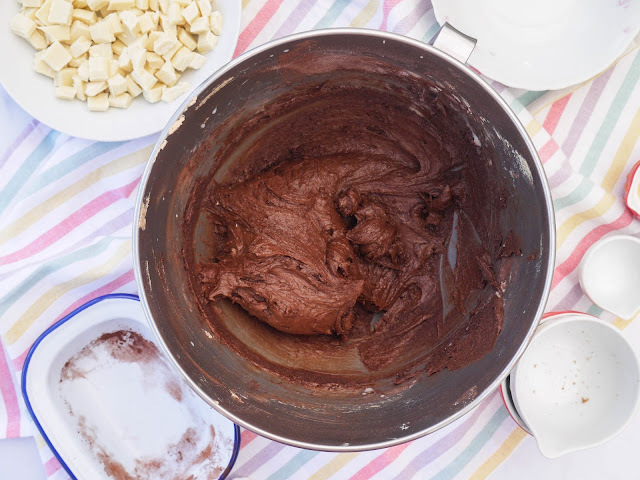 It won't be as messy as the brownie ones. Once all the balls have been rolled, we can put them together. 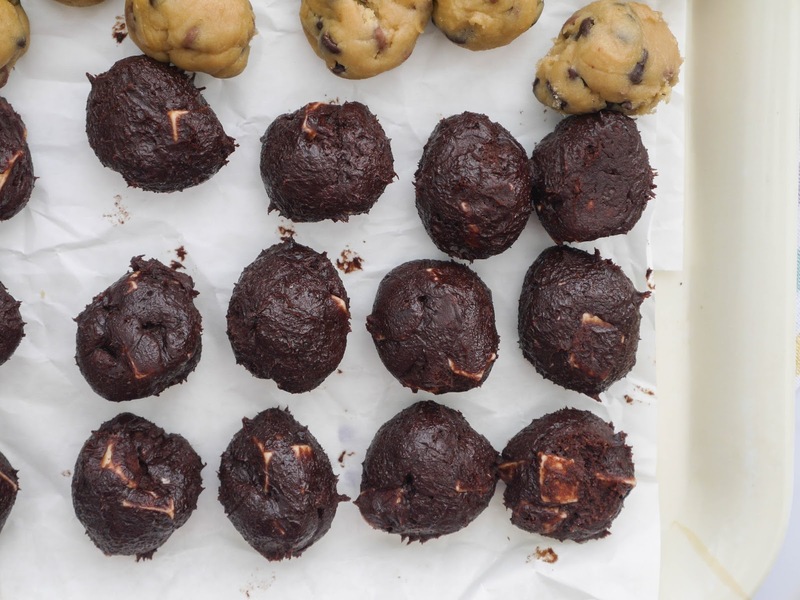 All you do is take one brownie cookie dough ball and one chocolate chip cookie dough ball and stick them together. It doesn't have to be perfectly round just as long as they stick together. 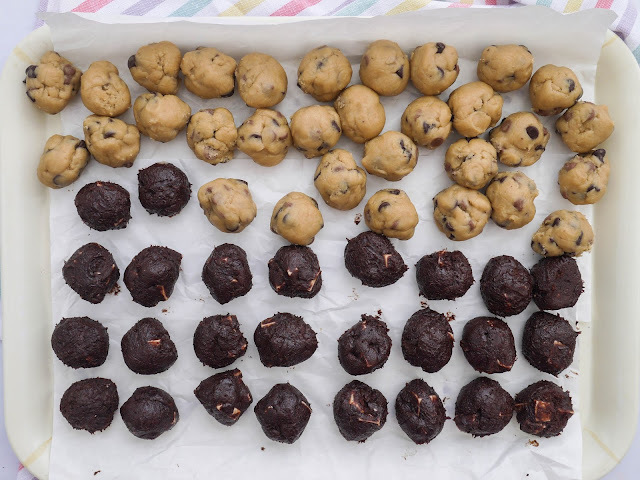 I had extra chocolate chip cookie dough and so just rolled them into balls to bake individually. 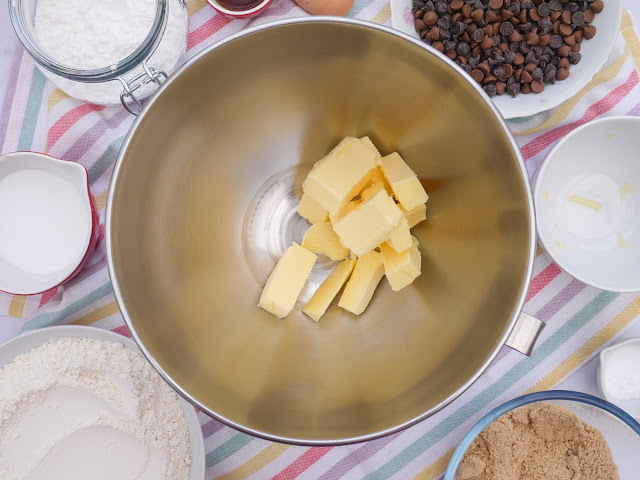 The cookies are now ready to bake. You can also chill the balls at this point, if you feel that they've gotten too soft. Also, you can freeze the balls too. 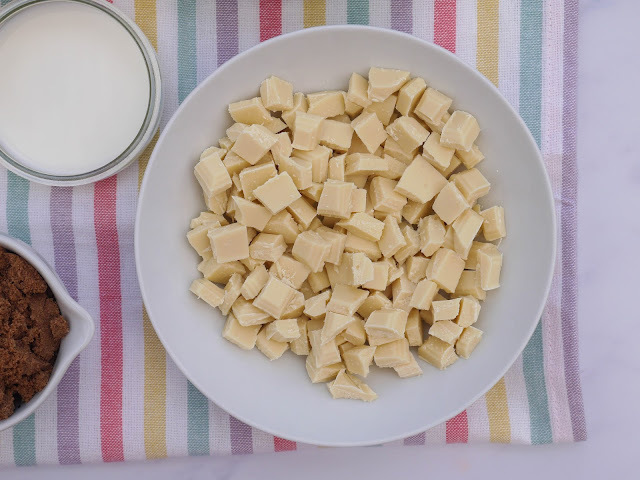 Freeze them solid on a tray before popping into freezer bags. 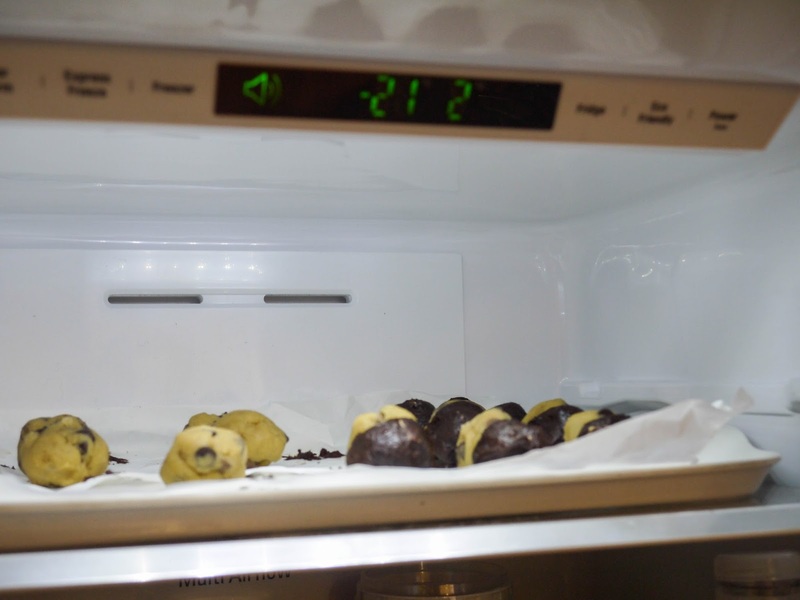 To bake, heat the oven to 180C. 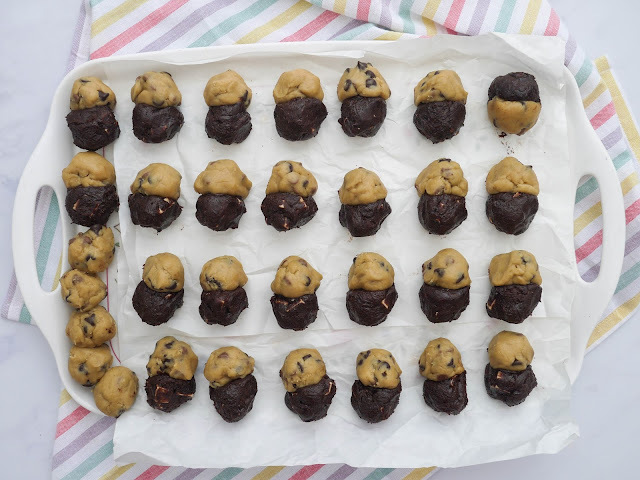 Place the cookie balls onto greased and lined baking trays, spacing them a little apart. I managed to fit 6 on my tray. Bake each batch for 12-14 minutes at 180C until the edges are golden. Let them sit on the tray for 5 minutes. 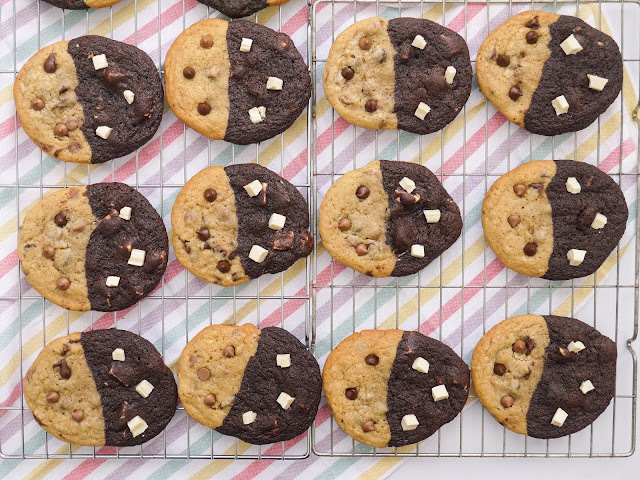 Whilst they're chilling on the tray, we can decorate them with any leftover chocolate. 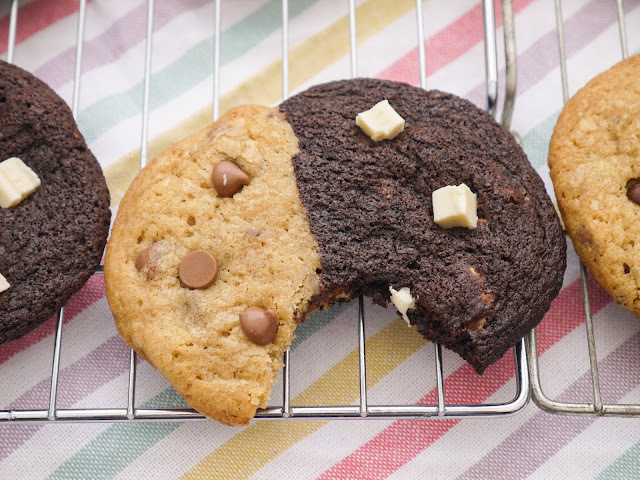 Place the chocolate chips onto the warm cookie. After 5 minutes, carefully move the cookies to wire racks to cool. They will firm up as they cool. Carry on baking the rest of the cookie dough or freeze/chill them. These cookies are real crowd pleasers. And, why not? 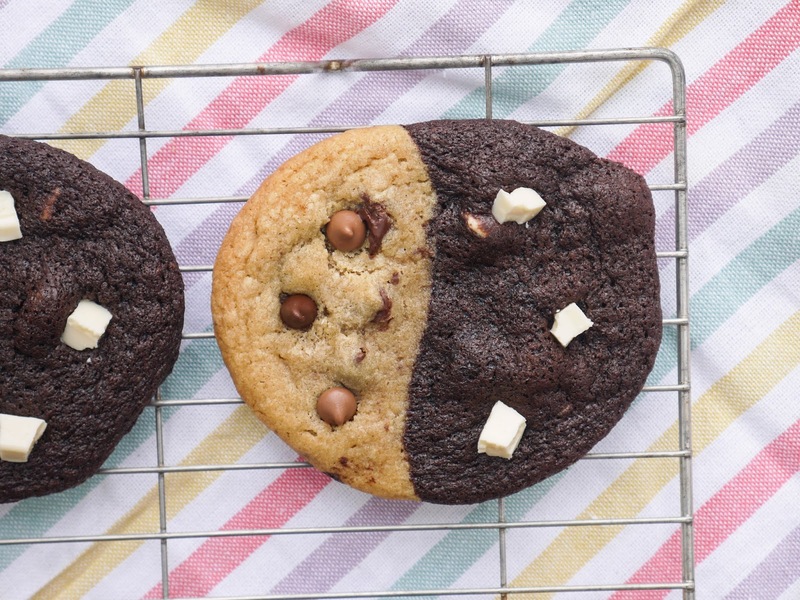 They're basically two cookies for the price of one. 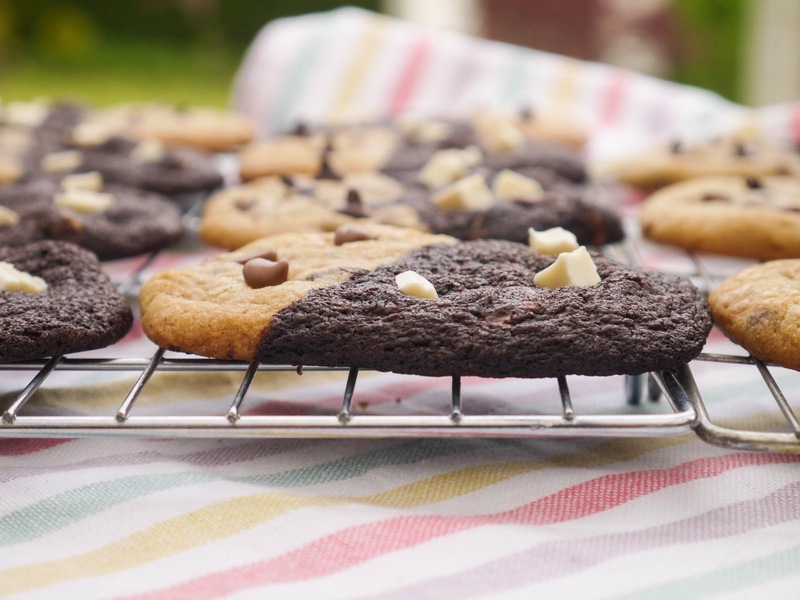 Enjoy them hot as they are with all those gooey chocolate chips. Cold, they're great dunked into hot tea or coffee. And if you want a real treat, use them to make ice cream sandwiches! Prep Time: About 1 hour plus overnight, to chill the dough. Bake Time: About 12-14 minutes. Serves: Made 26 swirl cookies + 5 chocolate chip cookies. 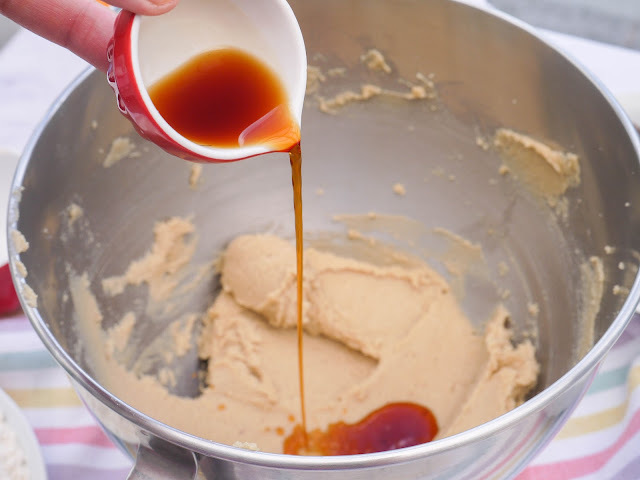 In a large mixing bowl, beat together the caster sugar, soft light brown sugar and soft butter for 5 minutes with an electric mixer until pale and well combined. Add in the vanilla essence and egg. Beat well until combined. 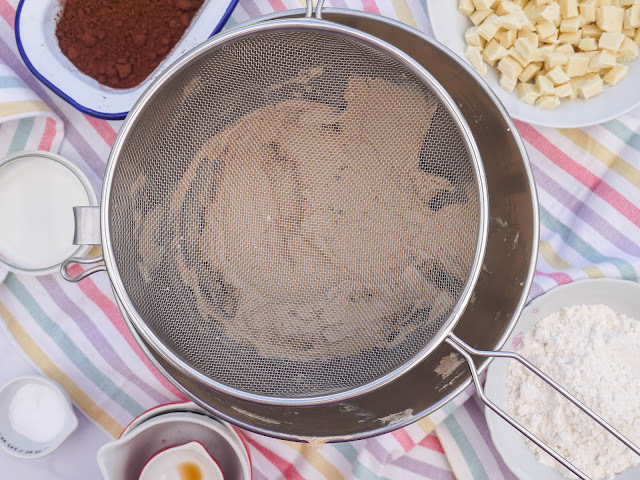 Put a sieve over the mixing bowl. Sieve through the plain flour, salt, bicarbonate of soda and cocoa powder. 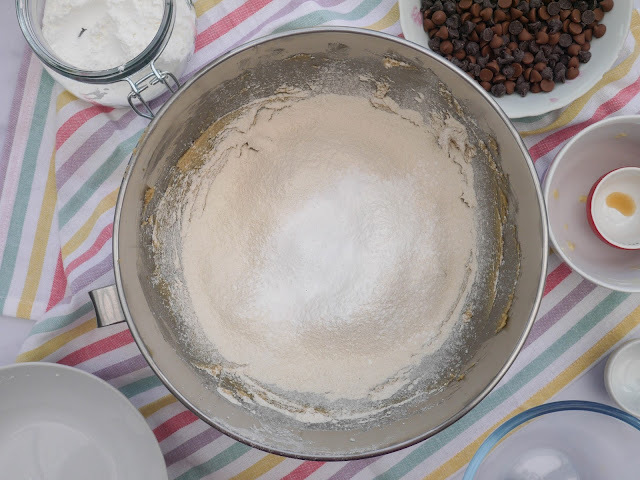 Mix with the electric mixer until well combined and you can no longer see the flour. Add the milk and stir it in. 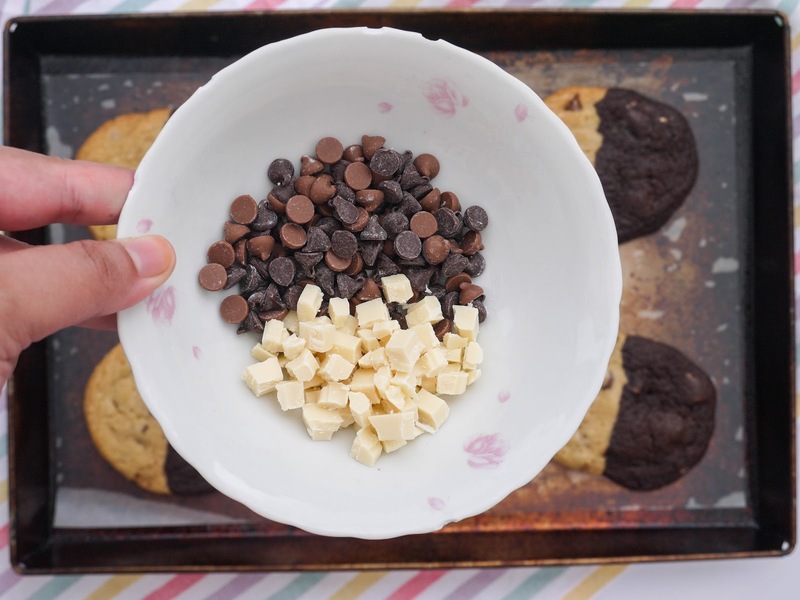 Add the white chocolate chips reserving a few for decorating the cookies, if you wish. 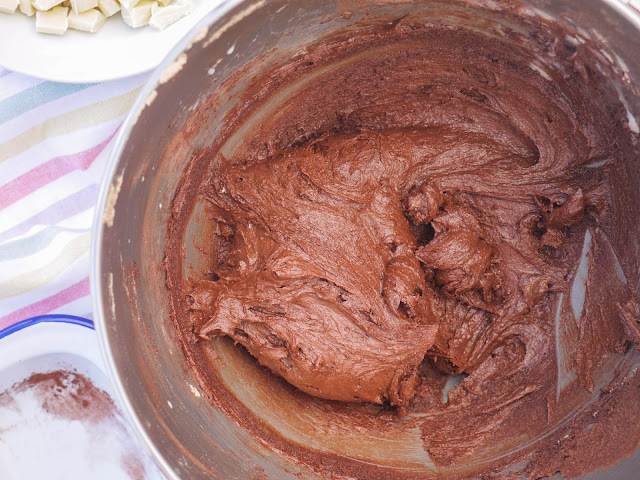 Mix in the white chocolate. Scrape the cookie dough into a bowl and cover with clingfilm. Chill in the fridge for a few hours or overnight. 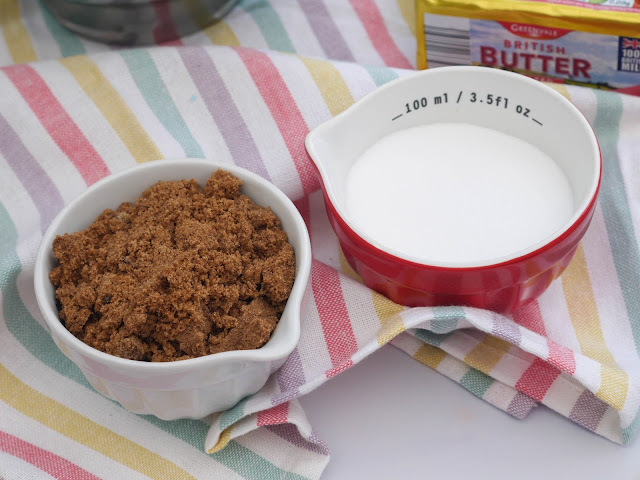 In a large mixing bowl, beat together the soft butter, soft light brown sugar and caster sugar for 5 minutes with an electric mixer until pale and well combined. 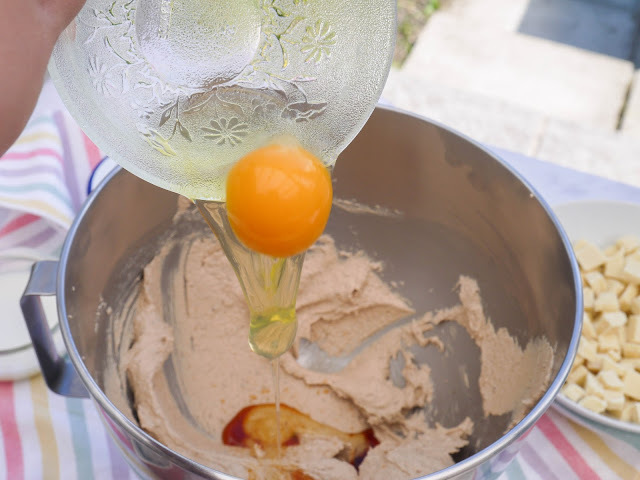 Add in the vanilla essence and egg. Beat well until combined. 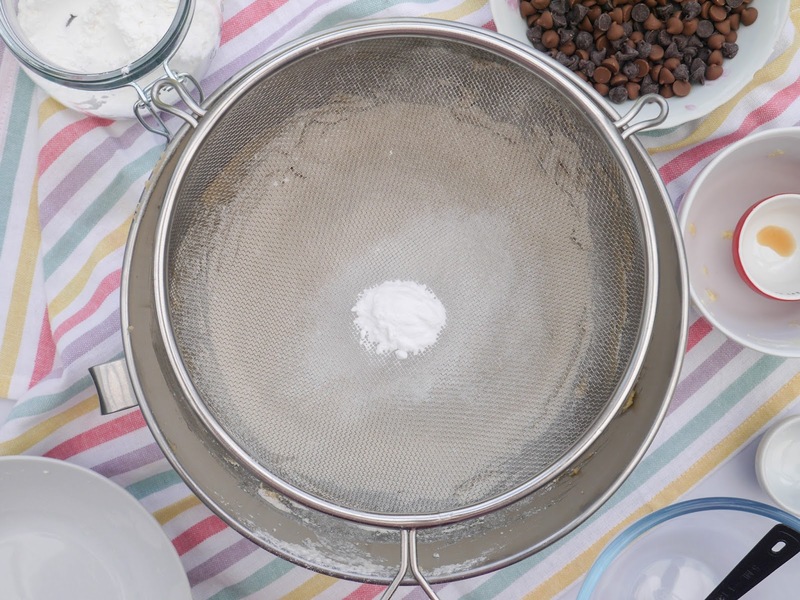 Put a sieve over the mixing bowl. Sieve through the plain flour, salt, bicarbonate of soda and cornflour. Mix with the electric mixer until well combined and you can no longer see the flour. Mix in the chocolate chips reserving a few for decorating the cookies, if you wish. 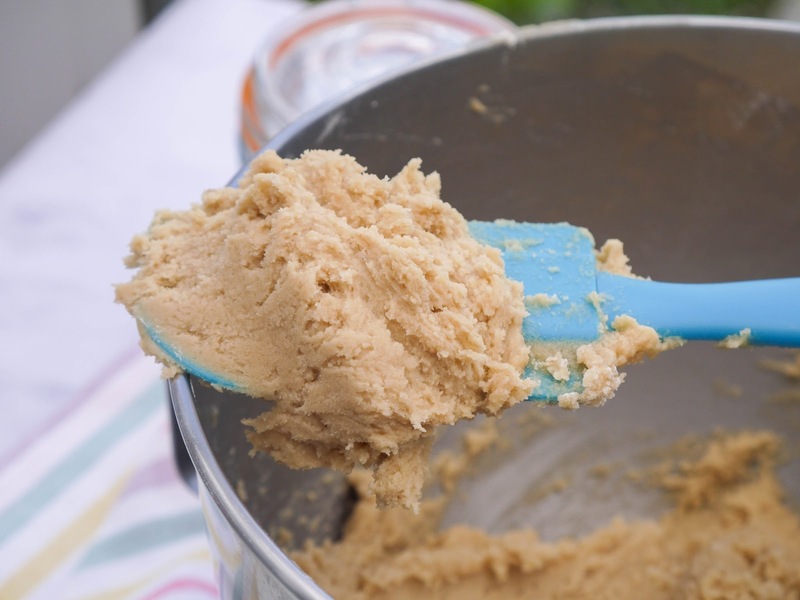 Using a small ice cream scoop or tablespoon, scoop out balls of each cookie dough. 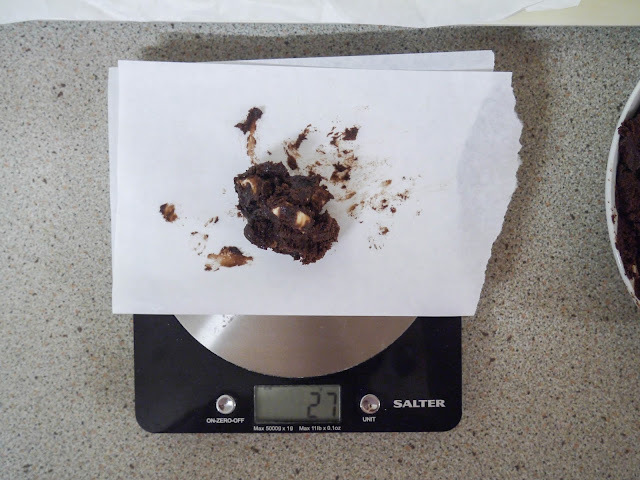 I did 27g per cookie dough ball. Roll into balls. It can get a little messy so I wore disposable gloves. Set the cookie dough balls onto a tray. 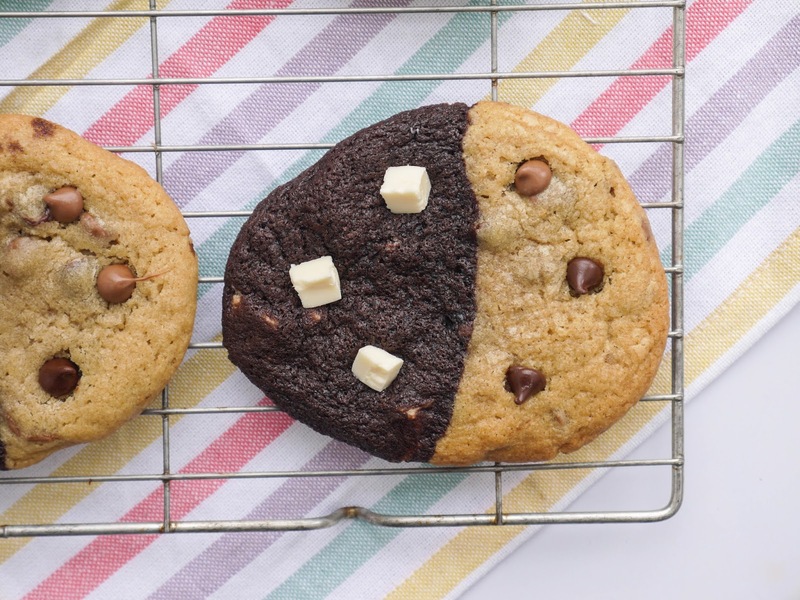 To shape 1 cookie, simply stick one of the brownie cookie dough ball and one chocolate chip cookie dough ball together. Continue making the rest. Pre-heat the oven to 180C. Grease and line a few baking trays. I baked 6 cookies on every tray, spacing them apart a little. Bake for 12-14 minutes until the edges are golden. Cool on the baking tray for 5 minutes before moving to a wire rack. Decorate by studding them with the leftover chocolate chips, if you prefer. 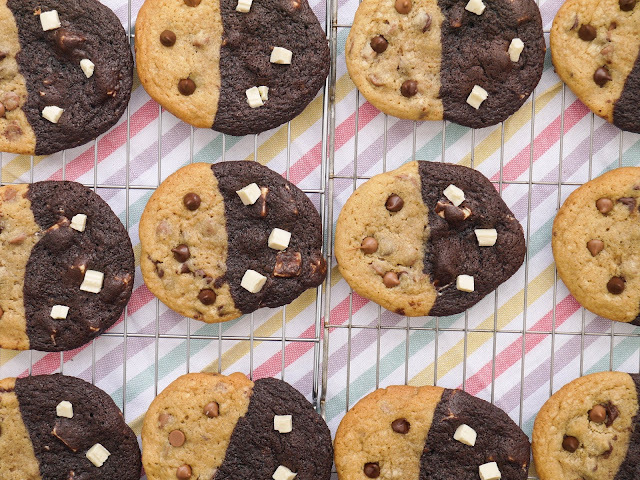 Continue baking the rest of the cookies. These cookies are best fresh. They will firm up a little once cold but are great for dunking into tea or coffee. Or if you want a real treat, use them to make ice cream sandwiches. 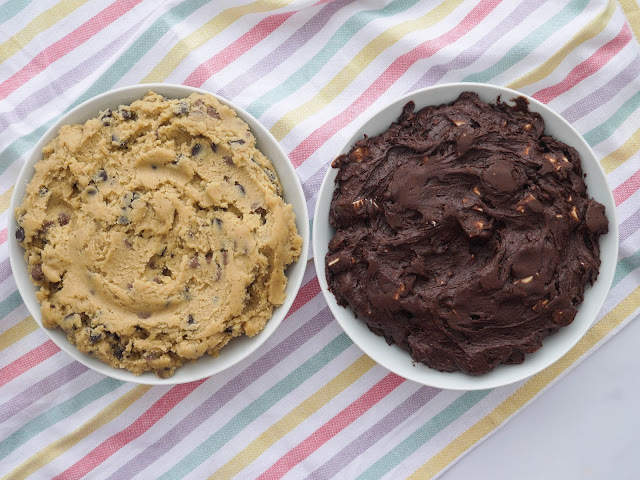 The brownie cookie dough will be stickier than the chocolate chip. 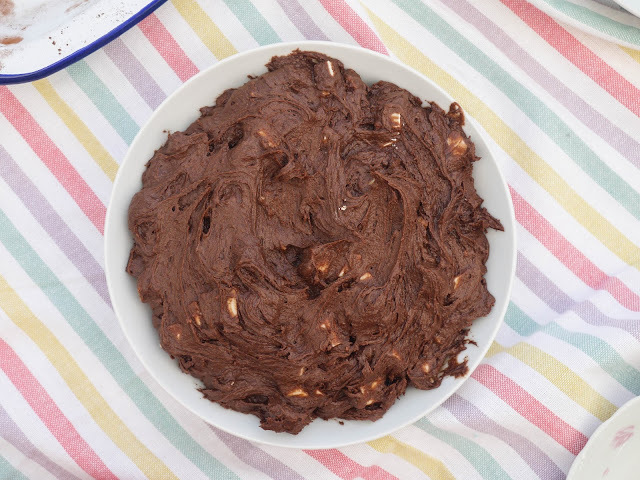 If it gets too messy to work with, chill it in the fridge for 15 minutes. 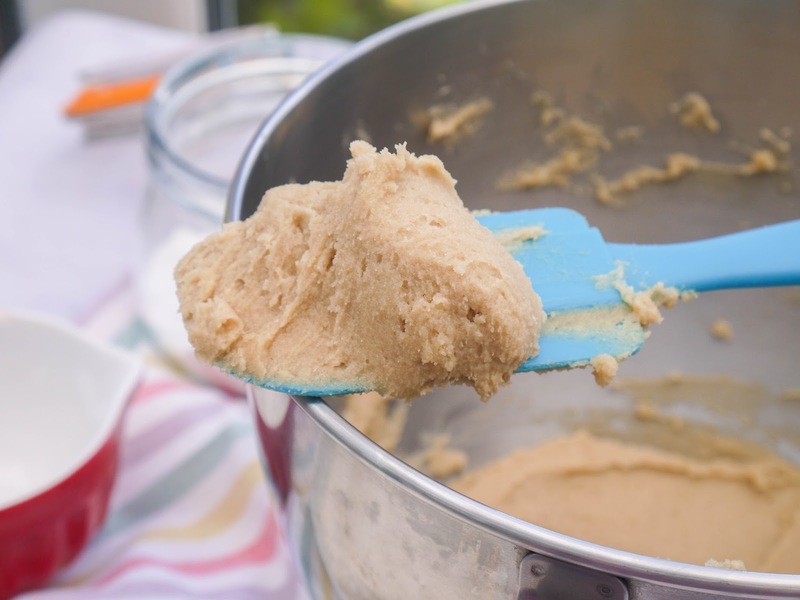 If the chilled cookie dough is too firm to scoop, just let it sit at room temperature for 10 minutes. The chocolate chip cookie dough will make a few extra cookies. Just bake them off as they are. 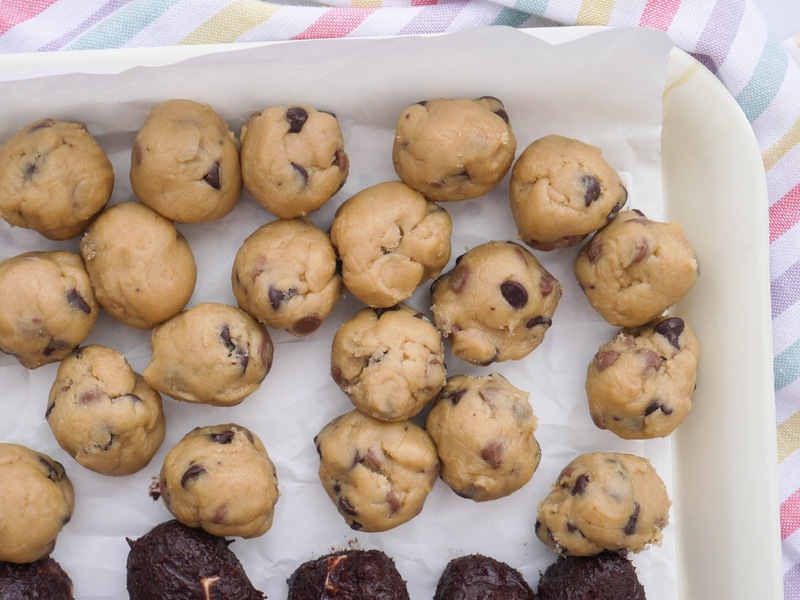 The cookie dough balls can be frozen then baked later. 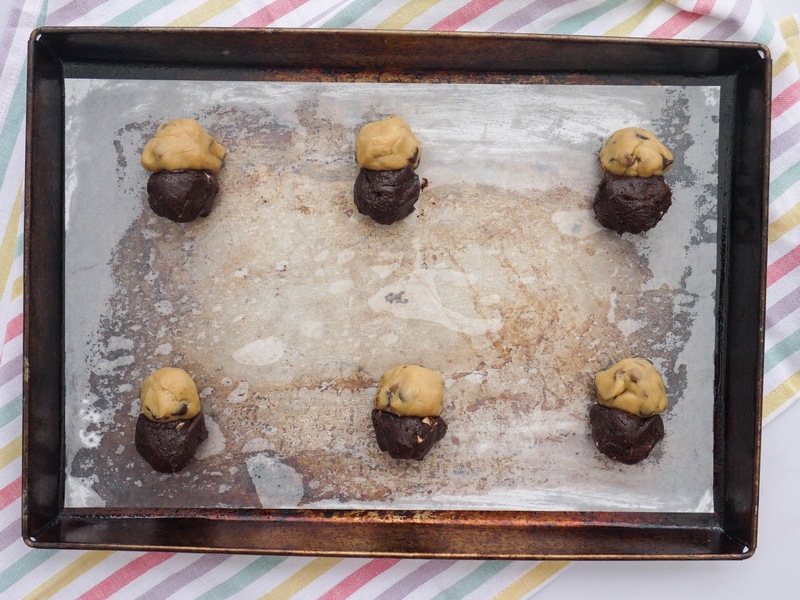 Freeze them in a single layer on a tray until solid then pop into freezer bags. Keep me in your duas please, and enjoy your swirl cookies! 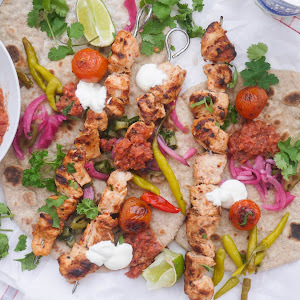 Jazakallah sister for all your delicious recipes, i have used many of your recipes, one of my favourites is your brown dal because of how quick and easy it is (im a vegetarian). 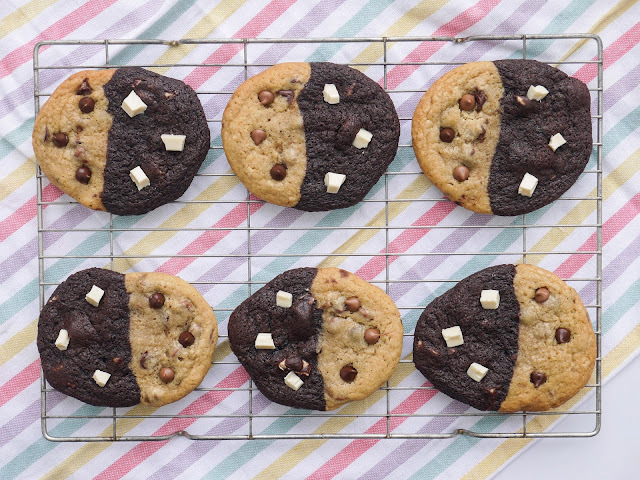 Im fasting right now and these cookies are making me hungry! 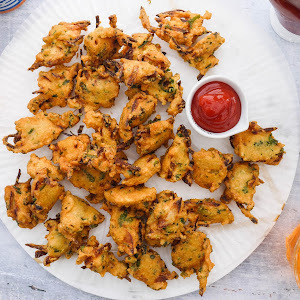 If i could make a recommendation, please could you upload a decent mixed veg samosa recipe, one without potato, as most online ones are just potato and pea which im not a big fan of. Ive tried tweaking this http://www.food.com/recipe/vegetable-samosa-filling-195139?scaleto=4.0&st=null&mode=us with using frozen mixed veg instead of potato and increasing spices (more garam masala, coriander cumin powder, tumeric, chilli powder, hing , mustard and cumin seeds) i cant seem to perfect my vegetable samosas! 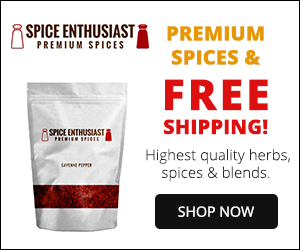 Also a tip, i noticed in your previous post, you mentioned that you put cumin seeds in your samosa pastry, i would recommend black onion seeds as it would taste a lot better in my opinion(more like naan!). Jazakallah khair and keep up the good work! Jazakallah khair for all your kind words and feedback. I'm so glad you enjoyed the brown daal. I'm on the hunt for a good vegetable samosa recipe myself. When I find a good one, I will post it. 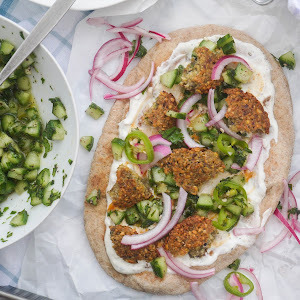 Black onion seeds sound so good in a samosa pastry - I will add them next time.